Desiring more control over how Macs got sold, Apple turned to CompUSA. November 4, 1997: Apple unveils its plan to open small “store within a store” sections inside CompUSA outlets around the United States. In a step toward the flagship Apple stores that would launch four years later, Cupertino-trained employees staff these mini-stores. The move gives Apple a bit more control over the way its products get displayed and demoed to consumers. 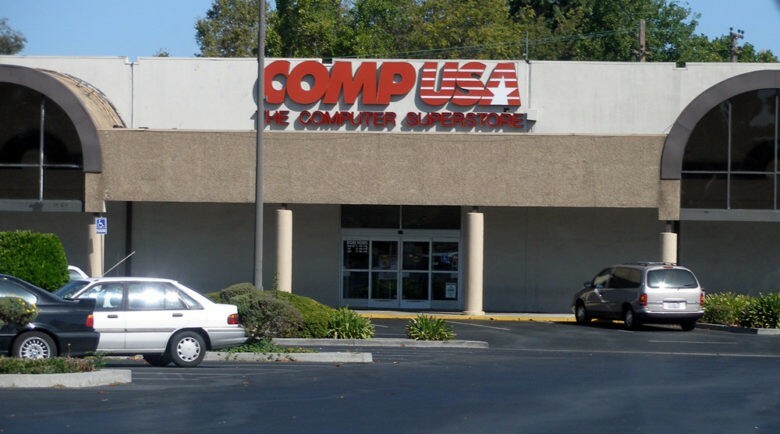 The deal with CompUSA, the computer superstore that eventually closed its doors in 2013, came shortly after Steve Jobs’ return to Apple to act as interim CEO, a position he remained in until summer 2011. The Apple faithful loved Jobs’ return to the company, but a great amount of skepticism remained in the marketplace. Apple’s iconic iMac G3, the machine that started to turn around the company’s fortunes, wouldn’t be released until the following August. All the company really had to show for itself at this point was its new “Think Different” advertising campaign (which was conspicuously short on actual products). Mac sales continued to sink, with Apple’s market share diminishing in the past 18 months. Apple just finished a horrible quarter, with a massive loss of $161 million. The news about the CompUSA deal therefore shocked a number of analysts. “I can’t imagine any reason for CompUSA to do this unless they were increasing their square-foot profit,” Lewis Alton, an analyst with L.H. Alton & Co. in San Francisco, was quoted as saying. Obviously, Compton’s belief proved correct in the long term. And, in the short-term, there was indeed evidence that Apple was starting its turnaround. Even ignoring secret projects that Compton wouldn’t have known about (the iMac G3’s success was bolstered by the arrival of the not-dissimilar iBook laptop), Apple still commanded user loyalty. In particular, it had been buoyed by the recent launch of Mac OS 8, which sold an enormous 1.2 million copies in its first two weeks — making it the most successful sales performance for an Apple software product at the time. Although Apple had been diminished by the arrival of clone Macs — an initiative Jobs quickly killed — quality was never the problem. Three things hurt Apple at retail: badly displayed merchandise, a lack of shelf space, and shop assistants who didn’t know what they were talking about. Apple struck the CompUSA deal to start changing that. The Apple “stores within stores” popped up at 40 locations in time for Christmas 1997. The rest of CompUSA’s superstores received the same treatment shortly thereafter. It would be a mistake to think that Jobs loved the CompUSA Apple stores. His retail preferences were for high-end retail outlets that focused on “big ticket” items rather than bulk selling of products. It’s no surprise to hear that Jobs borrowed the “store within a store” concept from the fashion industry. Clothing designers often occupy space within larger retail outlets, and exert much greater control over their product’s presentation. The approach was relatively new in consumer electronics at the time. To create a visual distinction from the rest of the CompUSA store, Jobs hired the same architectural firm that he employed to design his Stevenote town hall events. This provided an architectural unity that made the place you bought your Apple products look like an Apple product itself. Sadly, like much of what Apple did in the 1990s, the CompUSA Apple stores proved disappointing. Taking over 15 percent of each CompUSA store sounded like the dream solution Apple had been waiting for. In reality, the stores suffered from disappointing foot traffic. The fact that the mini-stores often languished near the back of the CompUSA outlets did not help. Apple simply needed more control. What’s clear, however, is that — looking back at it today — the CompUSA mini-stores were, essentially, early prototypes of what would later morph into Apple stores. Even today, Apple occasionally uses the “stores within a store” concept to promote items like the Apple Watch, which don’t easily fit into an existing category. Do you remember the CompUSA Apple mini-stores? Leave your comments below.